My Dad passed away about 18 months ago and he would have celebrated his birthday today. In our family we offer food, drink and flowers to loved ones who have died on special occasions throughout the year, such as Birthdays, Father’s Day and New Year, by setting it in a special place, lighting incense and making a silent wish for them to receive our offering. I’m not sure whether it has been playing on my mind or my dad has made a ‘special request’ but in my dreams last night, I was in our family home and he asked me to go to the corner shop to buy him a few things to eat. 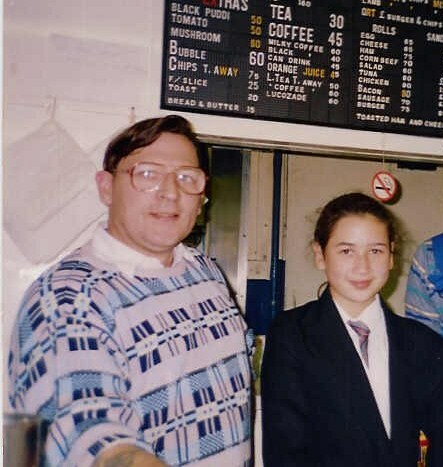 The picture above is of me and my dad at our first family business, a cafe in North London. If you look closely you will see that a cup of tea is only 30p!